Howl Bushcraft07927871192work Workshop/CourseHowl Bushcraft provide an introduction to the natural world, opening up skills and passions that will pull you head long into the greatest of adventures. The confidence gained from knowing you carry fire in your muscles and mind will change your outlook on the world, suddenly the wilderness will seem full of allies. The aim of HowlBushcraft is to provide the elementary skills needed to find solace in nature, practice a high level of respect for the natural world, and always instill sessions with the leave no trace ethos. Run with a specialist bushcraft instructor, course sizes are small, with a maximum of 10 people on each activity they ensure a high amount of direct interaction with the course leader. They also provide over night courses for small private bookings, so for families or groups of friends wanting to spend the night outdoors with a private guide check out the 26 Hours Outdoors page. The skills of bushcraft are ones best practiced and used. Whether you’re new to the outdoors or want to gain a deeper insight into skills you already have, this overnighting course is designed to be a personalized step into the nature where you’ll have not only the chance to learn but also use the techniques that are taught. You'll meet in the morning of day one to get started and prepare for the night ahead. 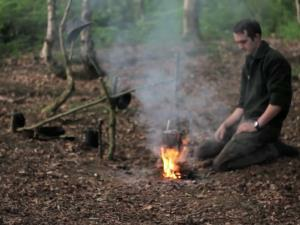 A bushcraft evening meal and breakfast are provided, and you’ll learn how to cook outdoors. All the skills covered will be tailored to your needs to maximize the value of your time with the team. Howl Bushcraft provide an introduction to the natural world, opening up skills and passions that will pull you head long into the greatest of adventures. For Larger groups wanting bushcraft activities, a custom day out in the woods will be provided. Drive along the A636 between West Bretton and Calder Grove, Our Flag is at the road side turn off. Parking is in a private car park 400 yards down this turning.